On January 30, 2018, the San Antonio Express News, Metro Columnist Gilbert Garcia confirmed that Steve Allison lied on his campaign literature. Mr. Garcia wrote, “there is no public record to support Allison's contention that he “argued against” the streetcar project”..... A fellow VIA board member is quoted: Allison “never took a public position” against streetcar. Please take a moment to read the article below (or click here to read the article on the Express News website) to learn more! To learn more read Carlton's editorial which clearly illustrates how Steve Allison a top decision maker on the VIA Board is being dishonest to the voters of District 121 about his role with the Streetcar Project. Continue below to read the article. Steve Allison owes an explanation to the citizens of Texas House District 121. For the last eight years, Mr. Allison was one of the top decision makers on the VIA Board and played a major role in the development, funding, and attempted construction of the streetcar. However, today as he runs to represent Texas House District 121, he is re-writing his record by falsely claiming that he opposed the street car project, and to add insult to injury, claims he was responsible for its ultimate defeat. Mr. Allison's campaign literature states “As Vice Chairman of an area transit authority, Steve argued against an expensive street car boondoggle that he thought threatened to end in an economic disaster. Most people agreed with him and the plan was abandoned”. Screenshot from Steve Allison's campaign website, taken on January 24, 2018. Website falsely claims that Mr. Allison argued against the Street car and worked to stop the project. This blatant fabrication is offensive not only to me, but to the other community leaders who worked tirelessly against the $400 million streetcar project. Furthermore it is insulting that he would attempt to win votes by misleading the citizens of District 121. For three years, I worked with community leaders and a large volunteer group of dedicated citizens to defeat streetcars. Together we put thousands of hours into research, attending VIA, county, & city meetings, and gathering 26,000 petition signatures. We were stonewalled by Mr. Allison and his fellow board members, attacked by city and county officials, and ridiculed by the media. Mr. Allison's false claim is disrespectful to the many folks who actually worked to defeat this wasteful project. Steve Allison was appointed to the VIA board in 2010. In 2011, he was part of the unanimous vote approving the Streetcar Master Plan (VIA Board Minutes July 26, 2011). Agenda Item 5: Long Range Comprehensive Transportation Plan (LRCTP) "Smartway SA" - for discussion and possible action related to the LRCTP to include identification and implementation of high capacity transit options under the plan. From 2011 to 2014, Mr. Allison actively supported the streetcar program. As a VIA Board member, he attended planning meetings and workshops, received briefings from VIA staff in his role as Chair of the Planning and Project Development Committee, and voted for streetcars on numerous occasions. Mr. Allison voted in favor of multiple versions of the Long Range Master Plan that included streetcars. He voted in favor of budgets that dedicated taxpayer funding to the streetcar project and in favor of awarding contracts related to streetcars. Mr Allison also voted in favor of interlocal agreements on streetcars and in favor of grant applications related to streetcars. All of this can be found in VIA’s own documents. In the recent Express News editorial board meeting, Mr. Allison claimed he had “abstained” on streetcars. This is what actually happened. On September 24, 2013 he joined other VIA Board members in abstaining from a single vote on the streetcar route due to a conflict of interest. It should be noted that for many of these board members the conflict of interest was due to owning land and/or potentially profiting from the street car being placed on the route in question. That said, in the very same meeting he voted in favor of the 2014-2018 Capital Projects Plan, which included streetcars, and voted in favor of the Fiscal year 2014 Budget and Five Year Financial Plan, which set aside funding for the streetcar project (VIA Board Minutes Sept. 23, 2013). 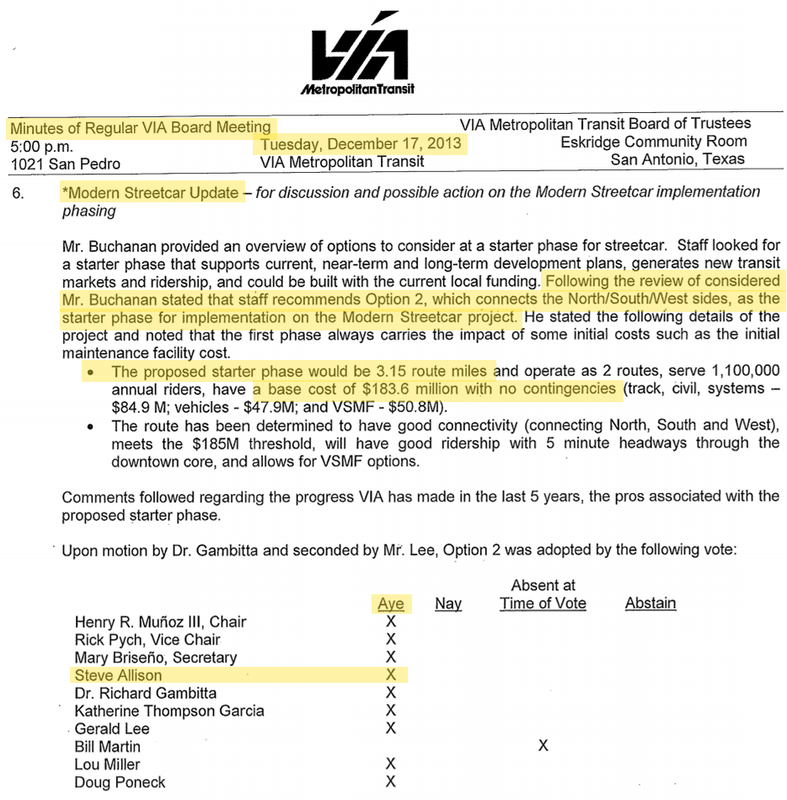 Three months later Mr. Allison voted in favor of a new streetcar route, deemed Option 2, that changed the route that he abstained on in September (Dec 17, 2013 VIA board Minutes). Agenda Item 6: Modern Streetcar Update - for discussion and possible action on the Modern Streetcar Implementation phasing. A comprehensive review of dozens of newspaper articles, press conferences, years of VIA Board minutes, and video tapes of official VIA meetings confirm beyond any doubt that Mr. Allison's claim of opposing the streetcar project is false. Mr. Allison did not speak out against or even remotely oppose the street car project. Furthermore, I contacted key members of the coalition opposing the street car, and none of them recall Mr. Allison ever pushing back against the Streetcar project. In fact, they recall him being a dedicated streetcar cheerleader. On August 23, 2016, Mr. Allison, now in the role of Vice Chairman, joined his VIA colleagues in a unanimous vote approving the VIA Vision 2040 Long Range Plan (VIA blog Aug. 24, 2016). This document clearly lays out a new attempt for streetcars, including additional routes and much higher costs. The price tag for the new streetcar project is in the billions of dollars. Mr. Allison was then appointed to Mayor Nirenberg's SA Tomorrow commission. With Mr. Allison's leadership, the commission adopted VIA’s new streetcar plan. The San Antonio City Council has now voted to accept the SA Tomorrow plan, including Mr. Allison's new streetcar plan. It is clear that Mr. Allison not only supported the streetcar plan that failed in 2014, but then he ignored the voice of the people and spent the next two years developing a larger and more expensive streetcar plan that citizens are just now learning about. First, if Mr. Allison will lie to the voters about his involvement with the streetcar project during a campaign, what else has he lied about? How can voters believe any of his campaign promises? Second, if Mr. Allison were to be elected, would he work as the people's representative, or as VIA’s in house lobbyist trying to divert state road dollars to the streetcar project? This is a fair question, especially considering that a significant share of his campaign donations come from individuals who do business with VIA and have an interest in the new streetcar project. Third, how can Mr. Allison claim to be a fiscal conservative when the VIA 2040 and SA Tomorrow Plan he created recommends funding the street car project with a multitude of new taxes and fees to be imposed on the citizens of Bexar County? There are two key issues for District 121 voters. First, Mr. Allison supported and continues to support a street car project that is unpopular with the voters. Second, Mr. Allison made a conscious decision to mislead voters by denying his extensive voting record and falsely claiming that he opposed street cars. This is the more egregious offence. Public officials must own their records and their votes. Nelson Wolff and I were on opposite sides of the streetcar issue, and we both endured a lot of criticism for sticking to our guns. In the end, streetcars failed but Judge Wolff never wavered on his position. He owned and defended his pro streetcar record, even when public sentiment turned against the project. Nelson Wolff always stayed honest about his role with the streetcar and for that he deserves respect. By contrast, Mr. Allison’s willingness to rewrite his record on streetcar by lying about the role he played is reprehensible. Candidates for public office have a duty to voters to honestly explain their past votes on issues, especially if those votes conflict with the voters wishes. Mr. Allison would be wise to own up to his record and defend it, rather than trying to mislead the people he wants to represent. At the very least he owes the people of District 121 an apology and he needs to change his campaign literature to reflect the truth.